The suicide of a loved one leaves a family with a huge loss and many questions, said Donna Kunkel, of Arkansas City. Kunkel knows this from personal experience. Her son Rhett tragically took his own life last October. "Suicide is an important subject to be discussed," Kunkel said in a recent interview. "Unfortunately, it isn't because of the stigma of suicide." Suicide Prevention Week is Sept. 5-11. Although there hasn't been a significant rise in the suicide rate in recent years, the rate for young men has quadrupled over the past 60 years, according to the American Association of Suicidology. Rhett was only 21 years old when he died, and his age group -- 15 to 24 -- is one of the highest at-risk for suicide. Nationwide, suicide is the third leading cause of death for youth. According to statistics from the American Association of Suicidology, a young person commits suicide every two hours and 15 minutes -- about 11 a day. Kunkel's feelings of loss from her son's death were rekindled after she watched TV coverage of the death of the teenage son of Rep. Todd Tiahrt, R-Kan. His son Luke, 16, died of an apparent suicide on July 24. "That's why I'm here," Kunkel said at the start of the interview. "After my husband and I watched that news report, I didn't realize I was crying. My heart aches for (the Tiahrts)." Kunkel said that suicide is a mysterious death because people don't know the "how" or the "why" behind a person's death. "Rhett was depressed and having some personal issues that, at the time, he thought could be resolved," she said. Her son had been arrested for driving under the influence the night before he took his life, but Kunkel believes the DUI was only one factor that may have caused him to take his life. She said her son had been taking antidepressants but constantly complained of headaches. She urged him to go to another doctor, but he put off doing so. "If you don't think you're getting the right help, go to someone else," she said. She doesn't blame her son for hurting the family, although his death does hurt. "I don't want anyone to say to me, 'How could he do this to his mom,'" she said. "It wasn't about me. Family was very important to Rhett. He loved me, he loved his dad and he adored his little sister." In a sense, Rhett's death has drawn the family together, but in grief, she added. "We all agreed that if we couldn't handle our grief, we'd go to a counselor. As a family, we now talk a lot." Dean Hall, a licensed marriage and family therapist in Arkansas City, said the number of suicidal clients he sees in this area has neither increased nor decreased in recent years. "It goes in waves," Hall said. "I'm seeing only a few now, but a year and a half ago, I had seven." In the winter, the number of people who are thinking about suicide usually rises, he added. Less sunlight and cold weather seems to make people depressed. The biggest two factors leading to suicide are alcoholism and drug abuse, Hall said. If a client is an alcoholic or drug user, Hall said he would refer them to treatment. "For most clients, though, depression is temporary," he said. "They find relief fairly quickly, within weeks." Hall suggests that people who are depressed or have suicidal thoughts need to seek the support of family and friends. And family and friends of someone who talks about suicide should take them seriously and offer their support. If there are drugs or alcohol involved, the family or friends should arrange an intervention to get their loved one into treatment, he added. "Most of the time, women will act suicidal in order to get help," he said. "But most men don't show signs they will commit suicide." 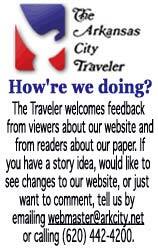 Register here to receive The Traveler email updates. If you have not received your E-News in the last two weeks, please re-register. One elementary school in Arkansas City is cutting back on recess to allow for more class time. Do you think this is a good idea?